‘Sinified’ religion has a role to play in Xi’s elevation of the United Front (UF) into a foreign policy tool. Informed by Qing imperial policy, CCP voices highlight the potential of state-managed Buddhism to advance PRC policy in Mongolia, where it has become a salient component of UF activity. Attention has been paid to the ongoing Jebtsundamba Khutugtu succession process, a sensitive issue, as it is perceived as a challenge the CCP’s neo-imperial reincarnation management system, which will undergo a major test when it comes to the selection of the next Dalai Lama reincarnation. Meanwhile, state-led interactions with Mongolian monasteries, some unreported even in Mongolia, reveal attempts to cultivate senior lamas and exploit internal divisions to counter Dharamsala’s influence and earn global Buddhist ‘discourse power’. Although the potential of religion as an influence tool in Mongolia is limited, the tactics used illustrate the Xiist expansion of UF work beyond its traditional domestic-diasporic domain. CCP religious policy involves both repression and co-option. Co-opting religion and other non-Party forces, both inside and outside China, is the job of the United Front Work Department (UFWD). Although UF tactics are a Leninist creation, prescribed to the CCP in the 1920s by Soviet advisors, the system the UFWD uses to manage religion is a post-Comintern innovation whose closest parallel is in North Korea. To survive as “patriotic” tools of the Party, imported religions such as Christianity and Buddhism must undergo “Sinification” (中国化), a demand stressed under Xi (CPC News, April 2016; People’s Daily, October 2016). The maxim “love the country, love religion” (爱国爱教) summarizes what the Party expects of religious believers. Since taking office, CCP General Secretary Xi Jinping has dramatically expanded the scope and importance of the UFWD’s role (China Brief, April 2018). Two characteristics of this unprecedented expansion of the UF system affect international religious policy. The first was the absorption of the State Administration of Religious Affairs (SARA, 国家宗教事务局), a government body whose duties included the execution of PRC religious policy, into the UFWD. The China Buddhist Association (CBA, 中国佛教协会), previously overseen by SARA, is thus now officially placed under the CCP. A second characteristic is the global expansion of the scope of UF work, evidenced by the recent use of UF entities to influence mainstream societies abroad. Previously, co-option of foreign religious organizations tended to focus on Overseas Chinese churches (To, 2009, p. 151) and Tibetans abroad (Journal of Current Chinese Affairs, 2012). However, efforts to create a more central role for the PRC in international Buddhist organizations, which once focused on Taiwan, have now taken a more global turn, at times placing the CCP in competition with India (Carnegie India, March 2017). 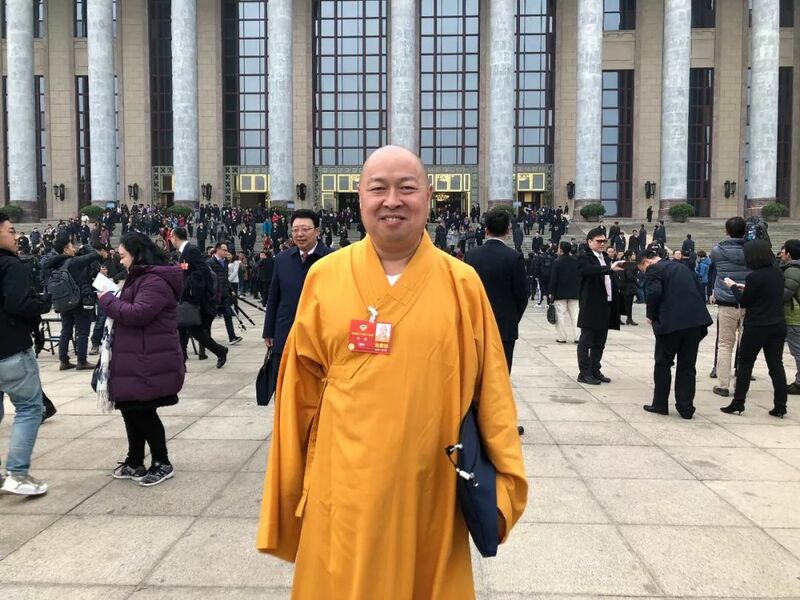 A visible figure in this global Buddhist push is Yinshun (印顺), a vice president of the CBA and president of its Hainan chapter. Yinshun is the abbot of three temples: two in southern China, and one in Lumbinī, Buddha’s birthplace in Nepal (Fenghuang Fojiao, October 2017; Caijing, December 2017) . Yinshun also heads the Nanhai Academy of Buddhism. The academy, which opened in the southern PRC city of Sanya in 2017 to provide training in Chinese, Tibetan and Theravāda Buddhism, immediately eclipsed a long-planned (and long-delayed) Indian competitor institution, Nālandā University. The UF significance of the Nanhai academy is illustrated by a visit to the facilities, soon before their inauguration, by the head of the Hainan UFWD (UFWD, September 2017). According to Yinshun, the goal of this endeavor is to offer the world a “Sinified Buddhist system” (Xinhua, September 2017). Although primarily religious in nature, this system is not insulated from political concerns. A roundtable Yinshun organized reached what he described as a “consensus” that “the South China Sea is Chinese” and “China has already become the center of the world’s Buddhism,” hopefully opening “a leading role in the world’s religious development” (Caijing, December 2017). On social media, he praised Xi’s report to the 19th Party congress—which he claimed to have copied out by hand—as “contemporary Buddhist scripture” (China Digital Times, December 2017). A branch of Tibetan Buddhism is the main religion in Mongolia. Although explicit UFWD statements on global policy toward Mongolian Buddhism are scarce, a set of goals can be distilled from available sources. Last year, the Party Secretary at the Tibetan Academy of Buddhism in Beijing advocated helping “countries and territories along the ‘Belt and Road’” satisfy their demand for religious specialists and scripture,” showcasing “the results of our Party and country’s ethnic and religious policies” (UFWD, June 2017). An earlier set of policy recommendations called on China to take the lead in coordinating the establishment of a unified system for the search, recognition and final announcement’ of incarnate lamas in the three countries. The article deals with the reincarnation of the Jebtsundamba Khutugtu, Mongolia’s most senior lama, a potential source of friction with the PRC . These recommendations were published pseudonymously by a Hong Kong think tank established by the PRC energy company CEFC (HKEJ, November 2011) . Former SARA head Ye Xiaowen (叶小文), a senior figure in religious policy involved in the Panchen Lama reincarnation process, was associated with the think tank at the time. Both of these sources mention restricting the influence of the Dalai Lama as an explicit goal. Recent interactions between Mongolian monasteries and PRC-based organizations are consistent with these goals, in some cases directly implementing them. The UF system appears to be exploiting divisions among Mongolian clergy. Some of Mongolia’s most important Buddhist monasteries have had contacts with the UFWD, SARA and CBA. These include the Amarbayasgalant, the country’s main place of Dorje Shugden worship, and the Ikh Khüree monastery in Ulaanbaatar, whose abbot Sanjdorj is noted for a bitter rivalry with the capital’s main monastery . Sanjdorj has criticized the Dalai Lama’s visits to Mongolia. In 2016, he regretted the Dalai Lama had been invited “without the approval“ of Mongolia’s “neighbors” (time.mn, November 2016). His views on the visit were quoted approvingly by PRC state media (Huanqiu, Nov 2016). A media outlet close to Sanjdorj has provided positive coverage of contacts with Chinese Buddhism and the 19th Party Congress (control.mn; March 2017, August 2016, October 2017); its editor-in-chief attended the CCP Propaganda Department’s Chinese Tibet Development Forum 2016 (chinanews, July 2016). Sanjdorj was also present when a foundation established by the Bank of China donated 9 million tugriks ($4,866 at that time) for another monastery (中蒙文化教育暨社会发展基金, Jan 2015). Sain Nomuun monastery in Nalaikh, one of Ulaanbaatar’s poorest districts, provides another excellent example of the UF in action. Implementing the vision laid out by its Party secretary, the Tibetan Academy of Buddhism (藏语系高级佛学院) in Beijing received its first contingent of foreign trainee monks in November. The monks came from the Sain Nomuun monastery. Led by Nergüi, their abbot, they were received by officials from the SARA, the CBA, and the PRC-sanctioned Panchen Lama (UFWD, 藏语系高级佛学院, November 2017) . Nergüi and Yinshun have exchanged visits. In June 2017, Yinshun visited the Sain Nomuun monastery, and, according to a news item posted to the UFWD website, Nergüi requested he send teachers to the Sain Nomuun (UFWD, June 2017). Members of Nergüi’s family, who run a company that helped build the monastery, were present at some of these meetings in China and Mongolia. The family belongs to the local business and political elite, including a former minister and the current chairman of the Ulaanbaatar city council. Yinshun has also appointed Nergüi a guest professor at the Nanhai Academy (南海佛学院, June 2017) In November, Nergüi was at Yinshun’s South China Sea Buddhism Roundtable in Shenzhen, attended by then-SARA director Wang Zuo’an (SARA, Nov 2017). Wang is now a vice-director of the UFWD. Interactions by PRC entities with Mongolian Buddhism tend to occur through vehicles with clear UF links, including SARA and UFWD officials, part of an application of UF policies to global Buddhism that has yielded early successes. Entities linked to the PRC party-state have cultivated local religious figures inside Mongolia and exploited divisions within the local Buddhist community, investing the PRC’s ‘religious capital’ to supply artifacts and train monks. The Sain Nomuun monastery’s endorsement of the PRC’s territorial ambitions and global Buddhist foray have also helped create a channel to Mongolia’s political and business elite. These successes should not be overstated. The UF tends to operate in a low-profile fashion, which can limit the propaganda value of its successes, both in Mongolia and elsewhere. Prevalent anti-Chinese sentiment inside Mongolia also naturally limits the soft-power potential of these contacts; PRC links have the potential to hurt a lama more than they help his PRC partners. Despite this, the Mongolian example shows a UF system bent on exploiting the religious capital acquired through the appropriation of Tibetan Buddhism. While the limitations of its Mongolian instantiation are defined by local conditions, the expansion of the domain of UF work to include religious groups abroad is of global significance. Speculatively, Xi’s potentially lifelong rule could give UF cadres enough time to venture beyond the neo-Qing model and apply similar tactics to religions other than Buddhism. Miguel Martin, who frequently writes under the penname Jichang Lulu, is an independent researcher with an interest in China’s activities in the Arctic and the United Front. Martin’s blog frequently is the first to break news on these subjects in English. Follow him on Twitter at @jichanglulu. The legitimacy of the ninth reincarnation, who died in 2012 in Ulaanbaatar, is a delicate topic in the PRC. As prescribed by the Comintern, Mongolia had forbidden further reincarnations after the eighth died in 1924, but a ninth was secretly recognized by the Dalai Lama. China discreetly protested his first visit to Mongolia in 1999 (refworld, 2003). A tenth reincarnation has been identified, although, as the Dalai Lama stated during a 2016 visit to Ulaanbaatar, the reincarnation is too young to be enthroned. Although Beijing vehemently condemned the visit, and retaliated against Mongolia economically and diplomatically, it refrained from public discussion of the reincarnation issue, only “hoping” Mongolia would handle the affair “autonomously,” a coded reference to its desire that the reincarnation’s enthronement and training take place without Dharamsala’s involvement (PRC embassy to Mongolia, Jan 2017). CEFC, which has recently run into financial difficulties, has known links to the PLA and has been involved in global influence activities (South China Sea Conversations, Jun 2013; Project 2049, Oct 2013; Sinopsis, Jun 2018). The Dalai Lama’s disapproval of the worship of the deity Dorje Shugden has led to a dispute with its followers, often aligning them with PRC policies (Info-buddhism, 1998, 2014). The PRC government has allegedly provided “clandestine support” to Shugden followers protesting the Dalai Lama (Reuters, Dec 2015; ICT, Apr 2015). PRC state media (CPC News, Apr 2010; Xizang ribao, Oct 2011; tibet.cn, Jan 2018; Guangming ribao, Jun 2012) and officials (CPC News, Jun 2013) have strongly criticised the Dalai Lama’s treatment of Shugden followers and covered Shugden protests against him in a positive light (tibet.cn, Aug 2015). Shugden worship is promoted within Tibet. Some Shugden followers have supported PRC government policies (Tsem Rinpoche, Oct 2017). Amarbayasgalant representatives attended a Shugden conference in Nepal in 2018, in which a monastery inside Tibet also reportedly participated (Kathmandu Tribune, Jan 2018; Tsem Rinpoche, Feb 2018). In 1995, the PRC government took into custody the boy recognized as 11th Panchen Lama by the Dalai Lama and enthroned a reincarnation of its own choice. Nothing is known of the boy’s subsequently. The PRC demands other countries uphold a “One-China Policy,” which it understands as acquiescing to its claim to sovereignty over Taiwan.